培训 – Training – Listen, Inc.
We can offer personalized on-site training – please email training@listeninc.com or call us at 617-556-4104 to discuss. We have run many of the modules from our SoundCheck training classes as webinars, and these are available online for anytime viewing. See our training webinars page for a full list of available online training. Seminar in Japan: High Resolution Audio Measurements and Loudspeaker Design. Two speakers will feature at this afternoon seminar focusing on high resolution audio measurements and Loudspeaker design. Steve Temme of Listen, Inc. will discuss the challenges of measuring high resolution audio. He will share his experience measuring devices up to 100kHz, and discuss which measurements give a meaningful insight into how the device sounds. Shinji Koyano of KOYANO Sound Lab (formerly of Pioneer) will discuss the basic theory and principles of loudspeaker design, focusing on recent technology. He will also present a case study of High-res technology on speakers. https://www.listeninc.com/wp/media/logo.png 0 0 Zarina https://www.listeninc.com/wp/media/logo.png Zarina2015-10-07 19:24:482015-10-07 19:24:48Seminar in Japan: High Resolution Audio Measurements and Loudspeaker Design. In this one-day seminar, Listen President Steve Temme will discuss current topics in audio measurement including high resolution testing, Bluetooth testing, headphone testing and open loop testing. He will discuss the current state of the art for making these measurements, and demonstrate how to measure devices such as microphones within tablets and smartphones, Bluetooth headsets, and high resolution headphones using the SoundCheck test system. We are holding a 3 day training event on Oct 5-7 in Santa Clara, CA. This event will feature a 1-day course on electroacoustics testing, presented by Chris Struck of CJS Labs, followed by a 2 day SoundCheck training class. In the Electroacoustics class, you will learn about the theory behind your audio measurements. The content will cover sound level measurement, psychoacoustics, electroacoustics, soundfields in real rooms, frequency responses, test signals and more. It is ideal for those new to the industry or anyone wishing to gain a better understanding of the measurement principles behind their acoustic tests. This hands-on class covers all the major features of SoundCheck version 14, including writing sequences, test signals, analysis, distortion measurements and more. The class is a combination of presentations interspersed with hands-on exercises to ensure that you are comfortable with all the concepts and methods taught before you leave the classroom. Although no previous SoundCheck experience is assumed, the course still offers plenty to users familiar with writing basic sequences. Although the SoundCheck training is intended as a 2-day program, it is possible to attend just one day of the training. 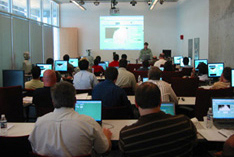 We are holding a 3 day training event on Sept 21-23 at our Boston offices. This event will feature a 1-day course on electroacoustics testing, presented by Chris Struck of CJS Labs, followed by a 2 day SoundCheck training class. We are excited to announce that we will be teaching three SoundCheck training classes, two in China and one in Taiwan in July, in conjunction with our distributor, S&V Samford. Instructor: Dan Knighten, Listen, Inc. The training will be translated into Mandarin. To register for one of these courses, please fill out and complete the registration forms above and fax back to S&V Samford at 852-28339913 or email sales@svsamford.com. For more information, please call S&V Samford +852 28339987. We are excited to be offering training on both East and West coasts this Fall. Classes will be held in our Boston offices on September 21-23, and in the San Jose area on Oct 5-7. Both sessions will follow the same format, beginning with a 1-day course on electroacoustics testing, presented by Chris Struck of CJS Labs. In this useful class you will learn about the theory behind your audio measurements. The content will cover sound level measurement, psychoacoustics, electroacoustics, soundfields in real rooms, frequency responses, test signals and more. It is ideal for those new to the industry or anyone wishing to gain a better understanding of the measurement principles behind their acoustic tests. The 2nd and 3rd day will be our 2 day SoundCheck training class. This covers all the major features of SoundCheck version 14, including writing sequences, test signals, analysis, distortion measurements and more. The class is a combination of presentations interspersed with hands-on exercises to ensure that you are comfortable with all the concepts and methods taught before you leave the classroom. Although no previous SoundCheck experience is assumed, the course still offers plenty to users familiar with writing basic sequences. Although the SoundCheck training is intended as a 2-day program, it is possible to attend just one day of the training. We are working on finalizing venues, but please put the dates in your diary, and we’ll have more information soon. San Jose: Plaza Suites, Santa Clara. Boston: Listen Offices. 580 Harrison Ave Ste 3W, Boston, MA 02118. We are excited to announce a 1-day SoundCheck® Advanced Training Seminar on Monday, June 1st 2015. This new training class covers a combination of advanced electroacoustics education and SoundCheck topics that are beyond the scope of our basic 2-day training course. It is of broad interest to most testing applications, although the open loop testing is particularly relevant to smartphone, tablet and other devices which do not have an audio path between test system and device. In celebration of our (and SoundCheck’s) 20th anniversary this year, we are offering this course at 1995 prices – just $199! Places are limited, so sign up early. Instructors: Steve Temme, Dan Knighten, Brian Fallon, Listen, Inc.
We have a great training line-up in Santa Clara on October 6-8, 2014! Our popular 2-day SoundCheck training course (Oct 7-8) is partnered with a one-day ‘Introduction to Electroacoustics’ course (Oct 6), taught by Chris Struck. Attendees may attend all 3 days, or just the electroacoustics or SoundCheck training. The 2 day SoundCheck course covers all aspects of using the SoundCheck software from setup and calibration through to writing sequences and understanding the software’s advanced options. The electroacoustic course focuses on the fundamentals of electroacoustic measurements, including principles of acoustics, instrumentation, and data interpretation as well as practical information on how to perform appropriate tests.